In February of 2014, NASA’s Discovery Program asked for proposals for the their 13th mission. Last week, five semifinalist were selected from the original 27 submissions for further investigation and refinement. Of the possible missions that could be going up, two involve sending a robotic spacecraft to a planet that NASA has not been to in decades: Venus! The first is the DAVINCI spacecraft, which would study the chemical composition of Venus’ atmosphere. Meanwhile, the proposed VERITAS mission – or The Venus Emissivity, Radio Science, InSAR, Topography, and Spectroscopy spacecraft – would investigate the planet’s surface to determine just how much it has in common with Earth, and whether or not it was ever habitable. In many respects, this mission would pick up where Magellan left off in the early 1990s. 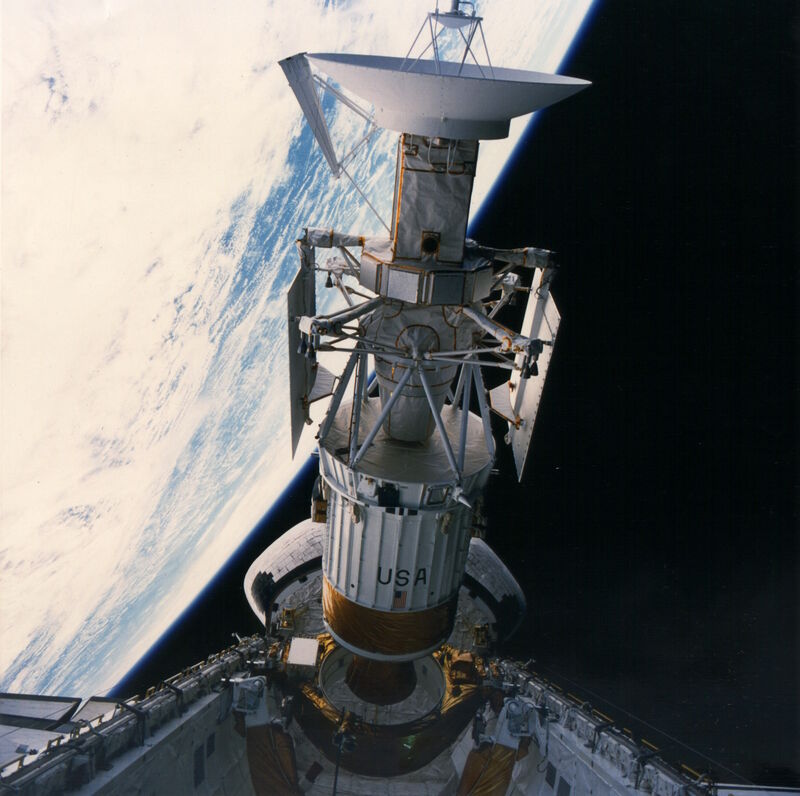 Having reached Venus in 1990, the Magellan spacecraft (otherwise known as the Venus Radar Mapper) mapped nearly the entire surface with an S-band Synthetic Aperture Radar (SAR) and microwave radiometer. From the data obtained, NASA scientists were able to make radar altimeter measurements of the planet’s topography. These measurements revolutionized our understanding of Venus’ geology and the geophysical processes that have shaped the planet’s surface. In addition to revealing a young surface with few impact craters, Magellan also showed evidence of volcanic activity and signs of plate tectonics. However, the lack of finer resolution imagery and topography of the surface hampered efforts to answer definitively what role these forces have played in the formation and evolution of the surface. As a result, scientists have remained unclear as to what extent certain forces have shaped (and continue to shape) the surface of Venus. With a suite of modern instruments, the VERITAS spacecraft would produce global, high-resolution topography and imaging of Venus’ surface and produce the first maps of deformation and global surface composition. These include an X-band radar configured as a single pass radar interferometer (known as VISAR) which would be coupled with a multispectral NIR emissivity mapping capability. Using these, the VERITAS probe will be able to see through Venus’ thick clouds, map the surface at higher resolution than Magellan, and attempt to accomplish three major scientific goals: get a better understanding of Venus’ geologic evolution; determine what geologic processes are currently operating on Venus (including whether or not active volcanoes still exist); and find evidence for past or present water. In many ways, VERITAS and DAVINCI represent a vindication for Venus scientists in the United States, who have not sent a probe to the planet since the Magellan orbiter mission ended in 1994. Since that time, efforts have been largely focused on Mars, where orbiters and landers have been looking for evidence of past and present water, and trying to piece together what Mars’ atmosphere used to look like. Each investigation team will receive $3 million to conduct concept design studies and analyses. After a detailed review and evaluation of the concept studies, NASA will make the final selections by September 2016 for continued development. This final mission (or missions) that are selected will launcd by 2020 at the earliest. What is the Average Surface Temperature on Venus? Venus is often referred to as our “sister planet,” due to the many geophysical similarities that exist between it Earth. For starters, our two planets are close in mass, with Venus weighing in at 4.868 x 1024 kg compared to Earth’s 5.9736×1024 kg. In terms of size, the planets are almost identical, with Venus measuring 12,100 km in diameter and Earth 12,742 km. In terms of density and gravity, the two are neck and neck – with Venus boasting 86.6% of the former and 90.7% of the latter. Venus also has a thick atmosphere, much like our own, and it is believed that both planets share a common origin, forming at the same time out of a condensing clouds of dust particles around 4.5 billion years ago. However, for all the characteristics these two planets have in common, average temperature is not one of them. Whereas the Earth has an average surface temperature of 14 degrees Celsius, the average temperature of Venus is 460 degrees Celsius. That is roughly 410 degrees hotter than the hottest deserts on our planet. In fact, at a searing 750 K (477 °C), the surface of Venus is the hottest in the solar system. Venus is closer to the Sun by 108 million km, (about 30% closer than the Earth), but it is mainly due to the planet’s thick atmosphere. Unlike Earth’s, which is composed primarily of nitrogen, oxygen and ozone, Venus’ atmosphere is an incredibly dense cloud of carbon dioxide and sulfur dioxide gas. The combination of these gases in high concentrations causes a catastrophic greenhouse effect that traps incident sunlight and prevents it from radiating into space. This results in an estimated surface temperature boost of 475 K (201.85 °C), leaving the surface a molten, charred mess that nothing (that we know of) can live on. Atmospheric pressure also plays a role, being 91 times that of what it is here on Earth; and clouds of toxic vapor constantly rain sulfuric acid on the surface. In addition, the surface temperature on Venus does not vary like it does here on Earth. On our planet, temperatures vary wildly due to the time of year and even more so based on the location on our planet. The hottest temperature ever recorded on Earth was 70.7°C in the Lut Desert of Iran in 2005. On the other end of the spectrum, the coldest temperature ever recorded on Earth was in Vostok, Antarctica at -89.2 C.
But on Venus, the surface temperature is 460 degrees Celsius, day or night, at the poles or at the equator. Beyond its thick atmosphere, Venus’ axial tilt (aka. obliquity) plays a role in this temperature consistency. Earth’s axis is tilted 23.4 ° in relation to the Sun, whereas Venus’ is only tilted by 3 °. The only respite from the heat on Venus is to be found around 50 km into the atmosphere. It is at that point that temperatures and atmospheric pressure are equal to that of Earth’s. It is for this reason that some scientists believe that floating habitats could be constructed here, using Venus’ thick clouds to buoy the habitats high above the surface. Additionally, in 2014, a group of mission planners from NASA Langely came up with a mission to Venus’ atmosphere using airships. These habitats could play an important role in the terraforming of Venus as well, acting as scientific research stations that could either fire off the excess atmosphere off into space, or introduce bacteria or chemicals that could convert all the CO2 and SO2 into a hospitable, breathable atmosphere. Beyond the fact that it is a hot and hellish landscape, very little is known about Venus’ surface environment. This is due to the thick atmosphere, which has made visual observation impossible. The sulfuric acid is also problematic since clouds composed of it are highly reflective of visible light, which prevents optical observation. Probes have been sent to the surface in the past, but the volatile and corrosive environment means that anything that lands there can only survive for a few hours. What little we know about the planet’s surface has come from years worth of radar imaging, the most recent of which was conducted by NASA’s Magellan spacecraft (aka. the Venus Radar Mapper). Using synthetic aperture radar, the robotic space probe spent four years (1990-1994) mapping the surface of Venus and measuring its gravitational field before its orbit decayed and it was “disposed of” in the planet’s atmosphere. The images provided by this and other missions revealed a surface dominated by volcanoes. There are at least 1,000 volcanoes or volcanic centers larger than 20 km in diameter on Venus’ harsh landscape. Many scientists believe Venus was resurfaced by volcanic activity 300 to 500 million years ago. Lava flows are a testament to this, which appear to have produced channels of hardened magma that extend for hundreds of km in all directions. The mixture of volcanic ash and the sulfuric acid clouds is also known to produce intense lightning and thunder storms. The temperature of Venus is not the only extreme on the planet. The atmosphere is constantly churned by hurricane force winds reaching 360 kph. Add to that the crushing air pressure and rainstorms of sulfuric acid, and it becomes easy to see why Venus is such a barren, lifeless rock that has been hard to explore. We have written many articles about Venus for Universe Today. Here are some interesting facts about Venus, and here’s an article about Venus Greenhouse Effect. And here is an article about the many interesting pictures taken of Venus over the past few decades.